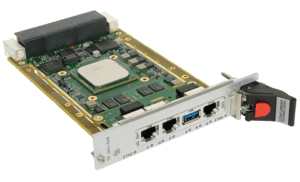 10 Gigabit Ethernet data plane ports could be used either as a system ingress/egress point or for local data connectivity within the chassis. 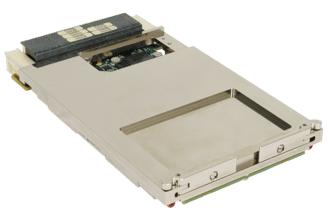 Two Gigabit Ethernet control plane ports are available on the backplane and two optional Gigabit Ethernet ports are available on the front panel of air cooled boards. 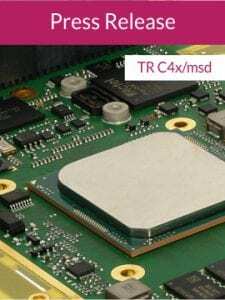 Augmenting the 10 Gigabit Ethernet data plane, TR C4x/msd provides up to x16 PCI Express® (PCIe®) lanes on the backplane with a theoretical bandwidth of 15.6GB/s. 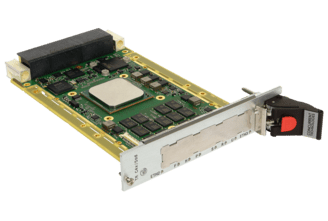 These PCIe lanes enable more flexible mesh configurations, for example it is possible to construct a multi-processor 40-core cluster using five TR C4x/msd boards with high-bandwidth 3.9GB/s expansion plane links without the use of an additional switch module. Such configurations are made possible with Concurrent Technologies’ Fabric Interconnect Networking Software (FIN-S) which makes use of the on board non-transparent bridge and DMA capability to aid multiple processor node clustering applications. Initial shipments will be air-cooled boards, followed in 2016 with rugged, conduction-cooled variants to satisfy deployments in the military, aerospace and transportation markets. In addition, TR C4x/msd is compliant with the recently ratified VITA 46.11 standard, designed to enable uniform system management functions across VPX based equipment.